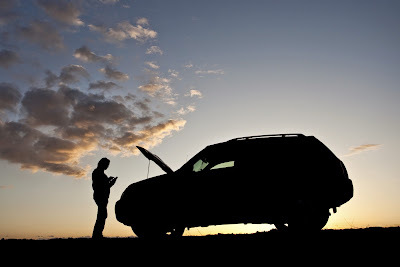 Your engine won’t start, your spare tire blows out, you run out of gas, you get stuck in the mud… car trouble tends to be one of those things where people think, ‘that won’t happen to me’… - until it does. Unfortunately, vehicle breakdowns happen often. Sometimes you may be at home or around people who can help; other times you may not. When disaster does strike, having a roadside emergency car kit can help you get back on the road faster, or at least stay comfortable while you wait. Reflective Warning Triangles – When you’re trying to change a flat on the freeway or jump a car in the middle of a lane, it can be a dangerous process. Bright, reflective warning triangles can be placed behind your car to warn oncoming traffic of the hazard ahead. Spare Tire – You should regularly check to make sure your spare is in good condition and also carry a tire jack and tire iron so you can change the tire without assistance. Jumper Cables – Familiarize yourself with your engine so you know how to jump your car before the battery dies. You can also keep an emergency battery booster in your car so you can jump the car without waiting for someone to stop and help. Duct Tape – Because duct tape can almost always help! A First Aid Kit – Whether you’re traveling across the country or just to work, there’s no telling when an accident will occur. Keeping a first aid kit in your car allows you to help treat both yourself and others while assistance is still on the way. A Flashlight – Handy for both car trouble and medical emergencies, flashlights (and extra batteries) are essential for any emergency car kit. A Multipurpose Tool – Small, portable multi-tools can be useful in a myriad of situations. Water Bottles & Food – Drinking water is one of the most important items you should stock up on. Nonperishable food is also essential to keep in your kit – energy bars, protein bars and MREs are ideal for situations where you may be stuck for an extended period of time. A Seat Belt Cutter & Window Breaker – Keep it in your glove compartment - not the trunk. This tool can mean the difference between life and death when you or loved ones are trapped in a car after an accident. Remember, the best way to survive emergency situations is to be prepared before disaster strikes. When you’re starting your own emergency car kit or need refill supplies for your kit, look no further than SOS Survival Products. If you have questions about what else you need to complete your car survival kit, feel free to reach out to the experts! We’re always happy to help.